Posted in: Uncategorized. Tagged: bug out bag, Dawn Of The Dead, First Aid, Hollywood, Night Of The Living Dead, Resident Evil, survival, Survivor, The Walking Dead, Zombie Apocalypse, zombies. OK sorry to dwell on a light hearted subject, but for some of us its downright fun! 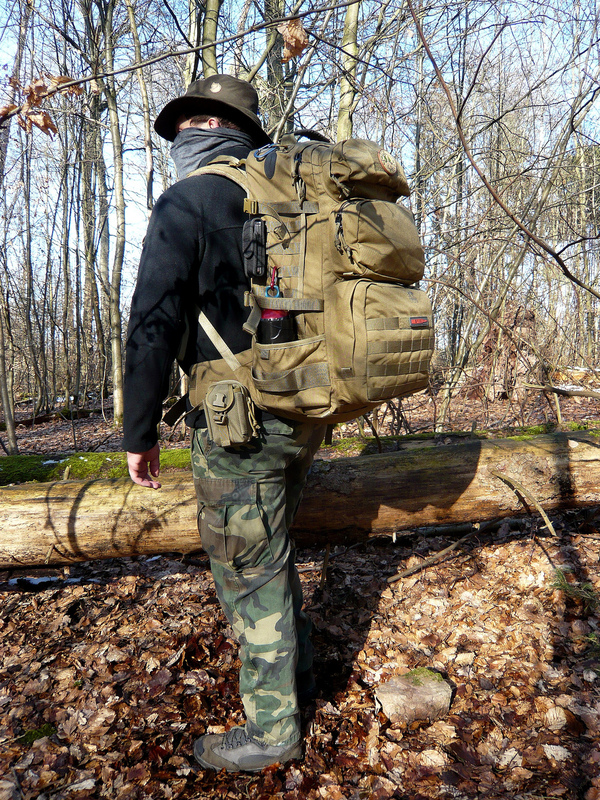 Today’s little entry on being a Zombie Apocalypse Survivor is all about bug out bags. For those of you unaware, this is a term given to a backpack in which you keep rations and equipment. A typical bug out bag is the same size as the one this guy is carrying. Inside it he keeps everything from weapons to camping gear, fishing equipment to the obligatory first aid kit, along with three days of water and rations. That’s got to be a heavy kit. This got me thinking about how fast the Zombies would be? In Night Of The Living Dead, they shambled along at about 2 miles per hour. (Seriously more horrid, imagine how slow death would be if you was caught). Resident Evil or The Walking Dead has them strolling along at about normal walking speed, 4 miles per hour. Now I don’t know about you but i think the guy in the PIC above may have a bit of bother if it came to running. 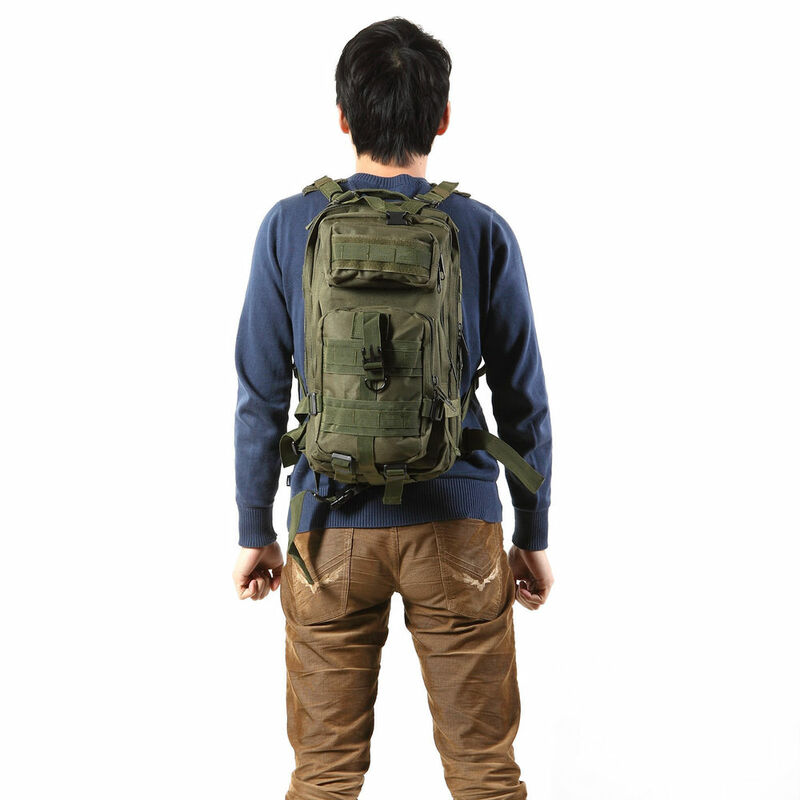 Though his pack is ideal for three days of camping after a natural disaster etc or getting otherwise stranded, I think a more ideal Zombie Apocalypse bug out bag would allow you to move around more freely. A sports sized one like in this PIC for example. They generally have about three or four compartments and are large enough to carry a couple of days of rations, first aid, and various other bits such as tarp and line, and the foil ‘space blanket’ for warmth. However provided its packed carefully you should still be stealthy enough to outrun at least the first two types of Zombie. I’d rather have that chance and scavenge anything else I need as and when needed. The chances of surviving such an event is pretty low, so I need to be as agile and prepared. I shall endeavour to assemble such a kit and introduce you to it here in a little while. Of course, such is the way of the world the big bug out bag is more appropriate in the reality. The Zombie one is just for shits n giggles. Posted in: Uncategorized. Tagged: diet, Food, healthy, Quorn, sausages, Zombie Apocalypse. Following on from yesterday’s post (do read it first if you haven’t already), I have test ran a simulated diet a typical survivor could forage together if the incident occurred albeit a couple of months out of season. I ate in that order too, after the second tomato I already felt quite full. Though each one doesn’t even contain 20 calories, they are packed with anti oxidants. The carrots contain a couple of good nutrients of course, and the radishes, despite tasting like a mouthful of table pepper. 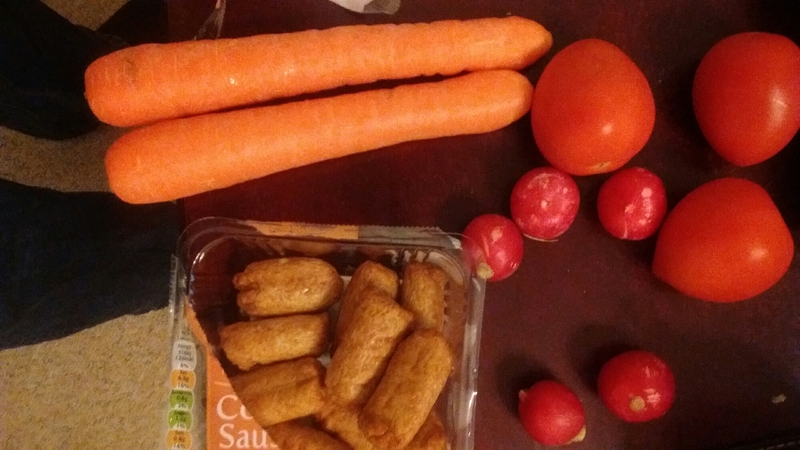 The Quorn sausages were very high in protein but also almost equally high in fat. About 12g of both per 100g. Just 4 sausages contained 124 calories. These would probably be made by grinding up mushrooms and biscuits in a post Zombie Apocalypse world. All these were washed down with a coffee made with cold water. All in all I feel like I’ve eaten well and the whole lot came to about 450-500 calories. I shall endeavour to eat in this fashion where ever possible, certainly lunchtimes. Let’s see if I feel any better for it! Posted in: Uncategorized. Tagged: munzee, Zombie Apocalypse.